The Herring Are Running, The Herring Are Running! Other than flowers, warm air, and lighter clothing, spring also brings the arrival of the herring to the Cape. There are several herring runs on Cape Cod (the most well-known being the one in Brewster on Stony Brook Road by the Grist Mill). There is a herring run in Wellfleet that is best viewed from Chequessett Neck Road. Harwich sees the herring run at the Herring River between Hinckley’s Pond and West Reservoir in Harwich. The Bound Brook Herring Run in Dennis is right off of Airline Road (near the Route 6A end). The small parking lot cannot accommodate many cars, but there is a lovely pond populated by ducks, swans, and other waterfowl, as well as a small cemetery. Another popular location to view the herring is at the Mashpee River in Mashpee which runs from Washburn Pond out to Popponessett Bay. Other spots to see herring in Mashpee include Quashnet River and the Santuit Pond fish ladder. 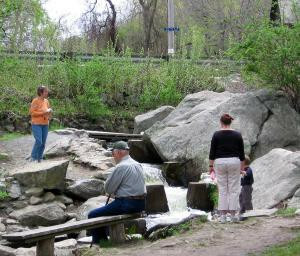 Herring run by Pilgrim Lake in Orleans, although that is not a common spot to go and view the fish. There are also fish ladders at Mill Creek and Upper Shawme Pond in Sandwich and Cedar Lake in Falmouth. Editor's note: As herring numbers have been in decline over the last several years, it remains illegal to take, touch or interfere with the herring in any way. All ages agree--the herring run is fascinating and fun, here in Brewster. Photo by Maggie Kulbokas.